I’m not sure exactly how a Nestlé product made it to the Natural Foods Expo West. 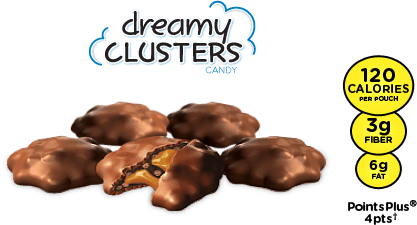 Snack item Skinny Cow (Dreamy) Clusters containing crunchy crisps & creamy caramel and “drenched” in milk chocolate also features artificial flavors, wheat, soy and palm oil for starters. Nevertheless, this product made it to the sample bags of the hundreds of attendees as they entered and exited the grounds, and eventually into the mouths of hungry or at least curious nibblers like myself. I will admit, they are delicious. At 120 calories per 1 oz serving, these bite-sized treats are touted as a perfect compliment to “all things skinny” a.k.a. diet friendly. Regardless, you will not want to indulge your sweet tooth too much. The clusters are the newest spinoff to their ice cream products and being sold currently in retail pharmacies and supermarkets such as CVS, Rite Aid, and Target for starters. (Search your local stores by zip code). Below is the nutritional breakdown. Word of advice: buyer beware. Always read your labels. Definitely not gluten-free or vegan/celiac friendly.